The person most surprised by that photo of a police officer fixing a kid’s bike that’s spreading like wildfire on the Internet? The officer himself. 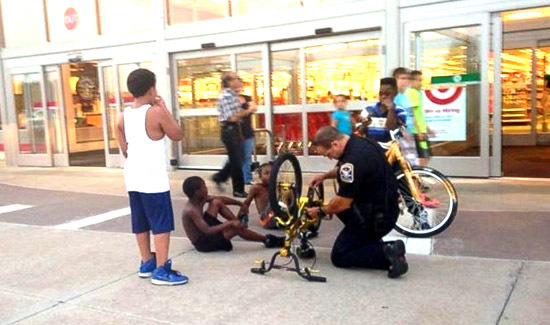 Police officer Michael Castillo, of Ansonia, Connecticut, was recently photographed helping a group of kids fix a bike. Castillo, 27, and a three-year police veteran, was called to a local Target Monday night amid a report of a fight outside the store. He says when he got to the store he saw a group of young boys he recognized from the neighborhood. “I asked if they were fighting and they said, ‘No, we’re just playing … we’re all friends,’” Castillo told ABC News. The officer saw that one the boys’ bikes was messed up. The chain was twisted. now ya see?? ?These are the kinds of images I’m willing to look at, rather than those pictures and news stories of either cops shooting and killing unarmed people or on the other side, people shooting and killing cops!